First we reside in Southern Alberta, Canada. I am 37 and have been training dogs since I was very young. I have fostered and trained dogs for shelters, pounds and rescues. I always worked with abused and abandoned dogs. I have raised several abandoned litters also. I have always had a love for our 4-footed friends. The reason I have switched to wanting to breed and train a pure breed dog is because I was diagnosed with a mental illness. I tried drugs and all sorts of treatments and none of them worked right for me. Then I learned about PSD- Psychiatric Service Dogs. Here is a link that explains a lot of the tasks these dogs do and what they are for. I researched them for a year learning how they could help people like me. After a year of research I decided to try it but because this dog was going to go out into public with me I wanted a pure bred. A dog that I would know the complete history of and what to expect health wise for the dog in the future. That’s when I started researching breeds. The one breed that I have always loved was the German Shepherd. They are versatile and easily trained if the training is done right. They are also strong willed, which is a very important trait when the dog has to take control in certain situations. The only problem was that the over all public has a fear of the black and tans and the pure blacks. I did remember seeing a White Shepherd when I was little but never since then. So I decided to look. I discovered that there are actually 2 types of whites. 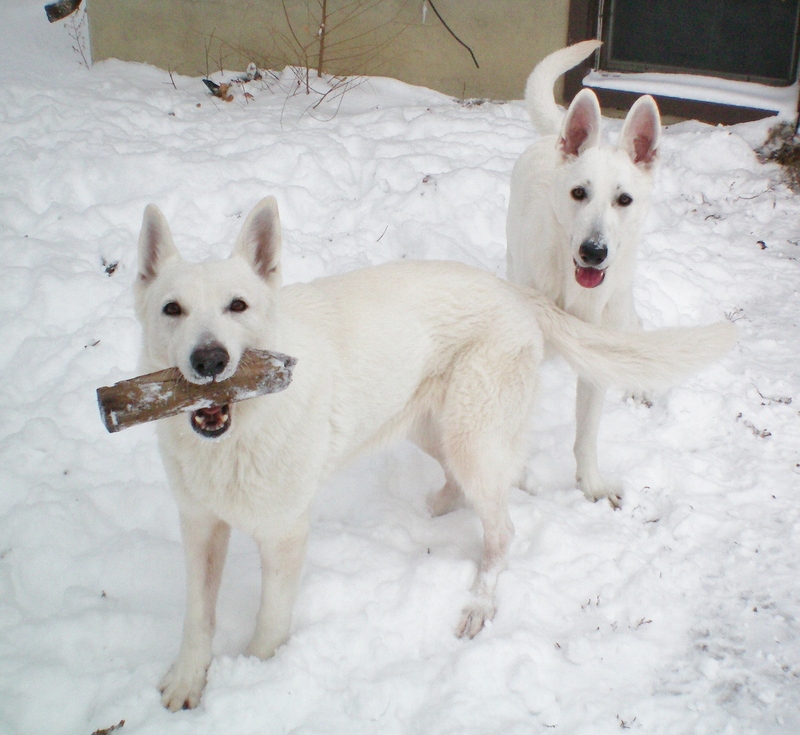 Albinos, which I would never breed for or with, and then the White Shepherd. For some reason the public had less fear of these beautiful dogs. So I started looking for a breeder. After a lengthy search and one litter with a breeder that didn't pan out, I found Sheena's breeder. I contacted her and let her know that I was only interested in the best. I let her know what I wanted Sheena for and that I was only interested in the best. If Sheena excelled in everything then my plan was to use her to start our kennel to pass on her traits and be able to donate Service dogs to training facilities. I quickly discovered that training and living with a pure bred can be totally different that working with mixed breeds. Sheena was the smartest dog and quickest learner I had ever worked with. Her sensitivity to my emotions was incredible. The way she picked up on everyone’s feelings and how she chooses to respond to them is amazing. I still love my mixed breeds and working with the shelters but my love and passion has been totally taken over by these wonderful dogs. One thing I did learn in all this is that there are so few pure breed dogs available for service dog training facilities compared with the huge number of people in need of them. Every year they are discovering new ways that these dogs can help, from detecting cancer before doctors can, helping the blind, deaf, wheel chair bound, there is a new one for people who have a sever allergy to chemical smells, for people who have mental illnesses and epilepsy. The list goes on and on. That is my main wish for any puppies that I breed. I will donate the pups that seem to have these sensitivities to these training facilities for the express purpose of going to people who would not otherwise afford them. For the ones that don't show this potential I would hope to send them to homes where they will be trained in Search and Rescue, Therapy, police work and so forth where these beautiful, intelligent dogs can be worked and trained to keep their minds busy. For the few who end up preferring to be couch potatoes I would prefer them to be trained in Agility and so forth for the socialization and the fun exercise. All of my dogs and the pups they will have must go through obedience and puppy kindergarten, which will be stated in my contract. Now Sheena is on the brink of full retirement and I have a new up and coming female that is a Berger Blanc Suisse. Her name is Daya and she is showing all the same promise and more that Sheena did. My goal is to produce outstanding working and service dogs that will be love and adored by their families and an asset to the community.